The most recent culture of the Upper Palaeolithic (the Late Upper Palaeolithic) in western and Central Europe is the Magdalenian, 20,000 - 12,500 years ago. 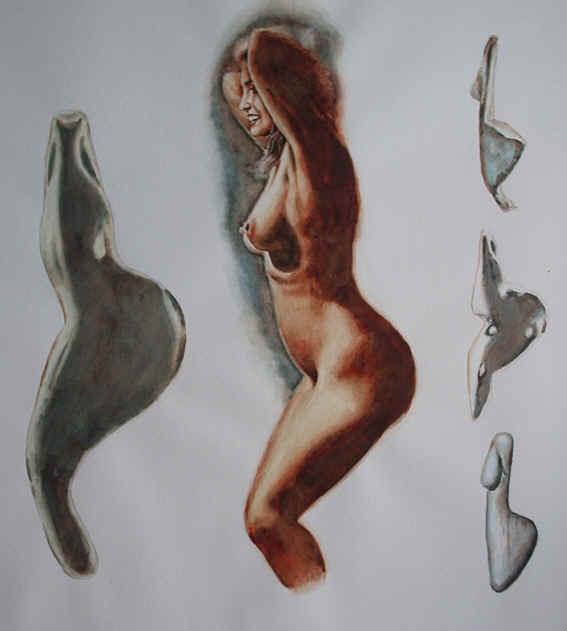 The Magdalenian appeared in western Europe after the last glacial maximum. It became the dominant culture of western Europe and spread to Central Europe, including Bohemia and Moravia (about 13,000 years ago). 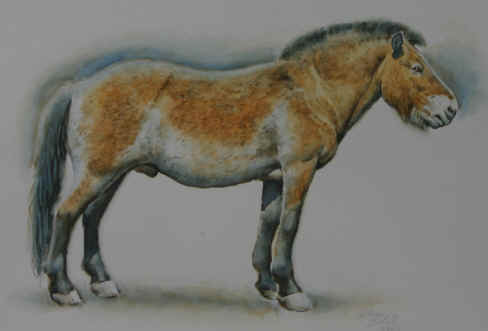 It was a culture associated above all with reindeer and horses. 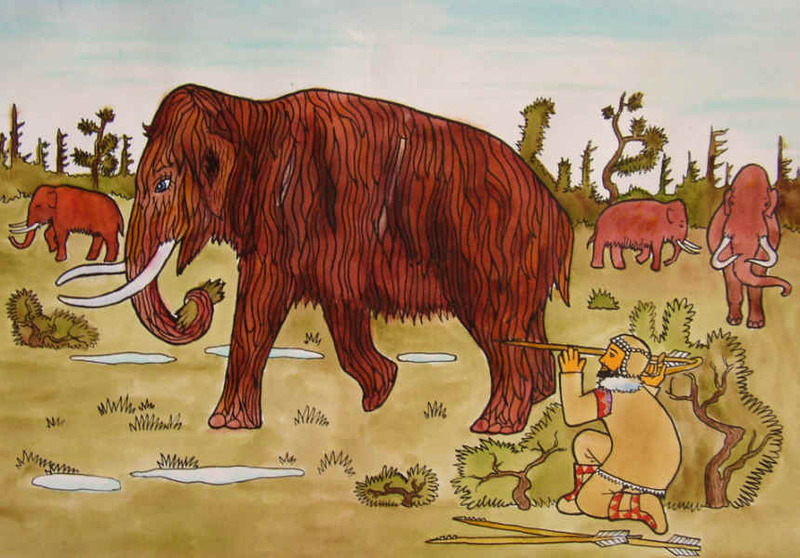 Mammoths were disappearing, although they remained an important motif in the art. 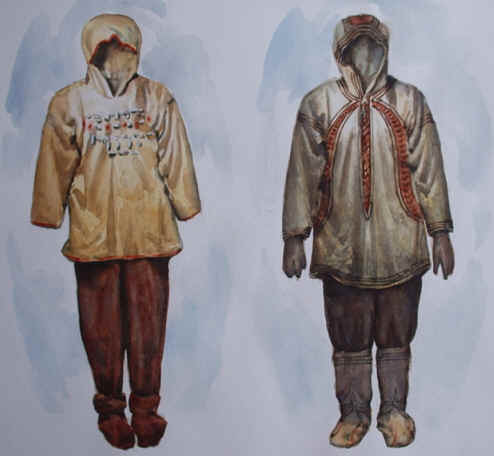 The Magdalenian is a typical culture of the Arctic-type hunters. A man of the Moravian Magdalenian. He holds a spear-thrower using the principle of leverage, and a spear with a bone projectil point with saw-like razor-sharp microlites. 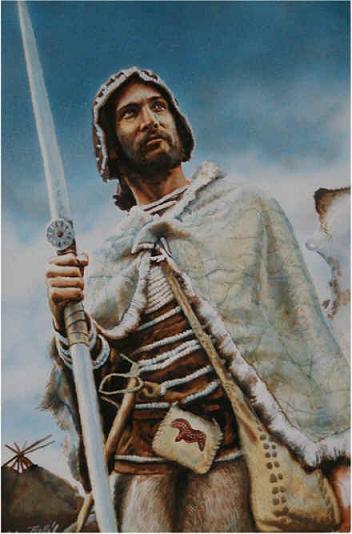 The horses on his clothing are depicted according to a decorated object found in the Pekárna Cave (the Moravian Karst). The map of the Europe shows the contours of the European continent and the area belonging to the Magdalenian cariboo and horse hunters. In the southeast and east of the continent was the late Gravettien area and in the northeast borders was situated the Hamburgien area. The red circles indicate the important archaeological localities. In front of the tent in the Pekárna in Moravian Karst cave. 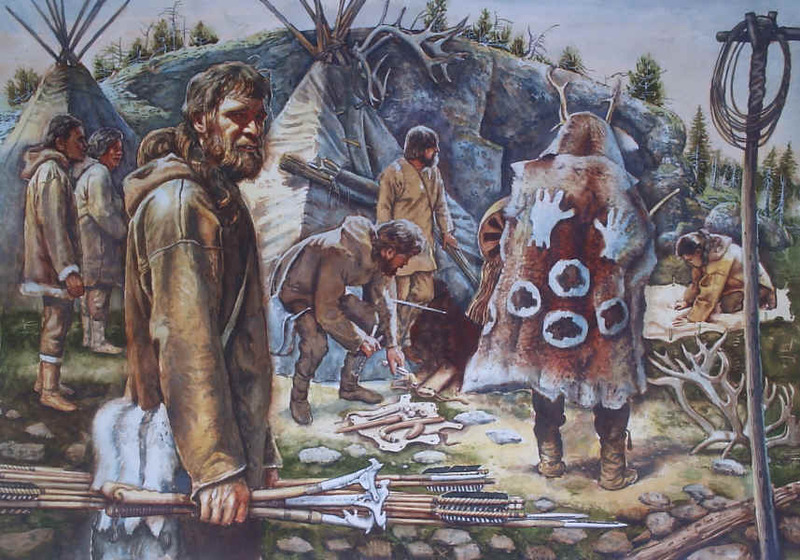 The large cave didn´t espace notice of the Magdalenian hunters, which were tracking the cariboos herds around the karst areas. In the cave of Pekárna, the rank of fireplaces was discovered across the corridor, which was probably the standing place of the tents. The cave climate was convenient for fabrication of the cariboo meat. The karst area enabled the hunters to use the terrain for building perfect traps. 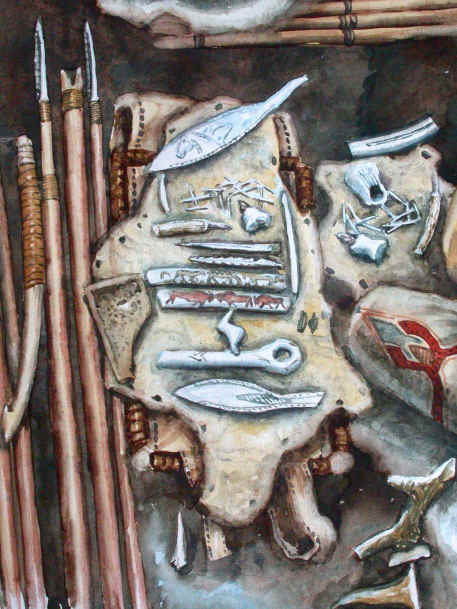 Fascinating artefacts found in the Pekárna cave: tiny bone needles, Silicit tools, embedded into boned or horn handgrip, harpoons, blade-liked, decorated artefacts and fascinating portrayals of the scenes of the wildlife on the horse ribs (grazing horses, fighting bisons). The picture takes us to southwest Germany, the well-known site of Petersfels by Engen. The narrow valley became a trap for hunted reindeer. Reindeer were killed there on a large scale, as the remains of their bones witness. The peculiarity of this picture is that the photographic studies were not created artificially, but were made just on the site, where well-versed fans displayed their home-made clothes, tents and Magdalenian weapons. Notice the antler heads of the throwing weapons, which were made so well that they can be compared with the artistic level of carving in butts of the recent firearms. One of the most beautiful and imaginative engravings on the thrower represents two fighting Capricorns. The Trois Frères cave in France. The image reconstruction represents the artefact in it´s original form (the heads of the Capricorns are not preserved). The picture represents the projectile point of the thrower and the way of fixing it to the thrower before the throw. A bone point from the Drátenická Cave in the Moravian karst. This artefact is now in the Institute Anthropos, which is a part of the Moravian Museum (Moravské zemské muzeum) in Brno. You can see (the lower part to the right) an impression of the former careful and fine binding. The reconstruction depicts the procedure of its piecing together. The convenient terrain helps during the hunting. The Northern societies often hadn´t have enough members for driving the gregarious animals. Therefore, they built stone pillars, which the hunted cariboos were not able to distinguish from the hunter. 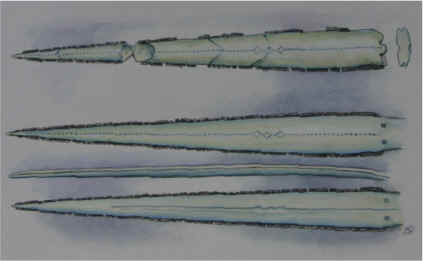 The bone needles found in abundance both in Petersfels and the Moravian Karst are different from those of the Gravettian. The woman in the picture is sewing a piece of clothing using an awl and a needle. The man is repairing the bone point of a weapon. He easily replaces individual broken segments of the cutting edge with new ones. To the left from him, there is his equipment, such as throwing weapons, lamps, a chieftain’s baton, a flute and bone points. The reconstructional imitations of clothes dating back to the era of the Magdalenian reindeer and horse hunters. The first clothing is exhibited in the Museum of Engen. You can see decorative patterns made according to an ornamented shovel-like object found in the Moravian Karst on the right clothing. 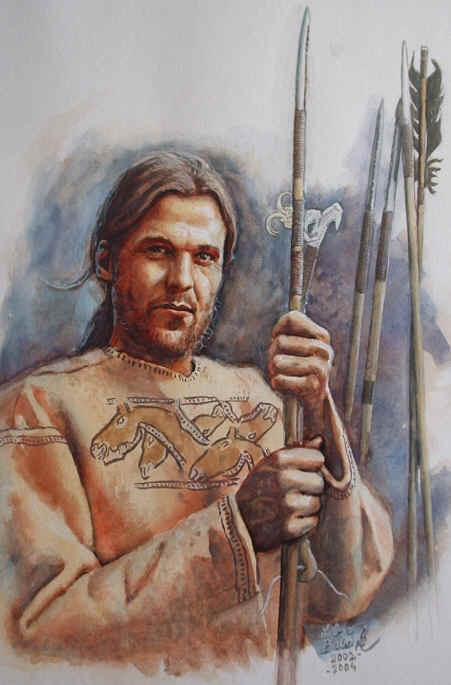 A spear-thrower was ideal for hunting animals living in herds, such as horses and reindeer. It was capable of shooting a maximum amount of projectiles within a minimal period of time. The accuracy of shots at a mass of running bodies was unimportant, the work was completed by sharp points. Most likely massive stone pillars were used when driving reindeer. Reindeer avoided them in the same way as they avoided people. That is why the Magdalenians preferred such environment where limestone screes, of which they erected the pillars, were available, e.g. outcrops of limestone, which are characteristic of the karst areas. The whole life of these people was closely connected with animals living in herds, and it formed their culture. 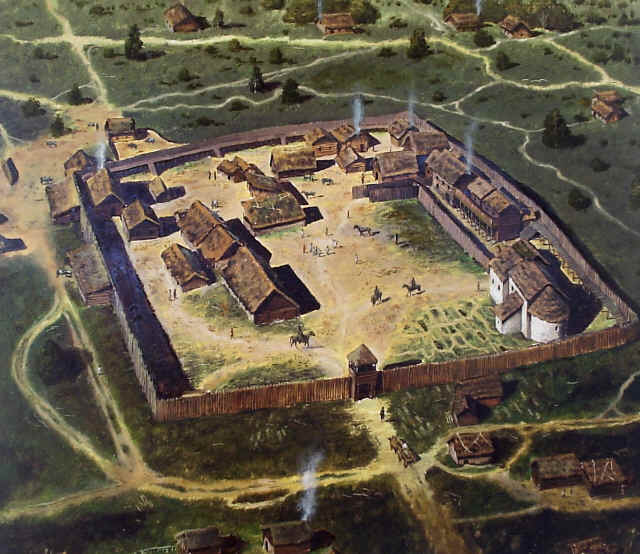 The Magdalenian settlements came to Central Europe, namely to Poland, 16,000 years ago and to Moravia about 13,000 years ago. We would like to thank Mr. Jiří Červinka from Prague for his help during the realisation of this reconstruction. 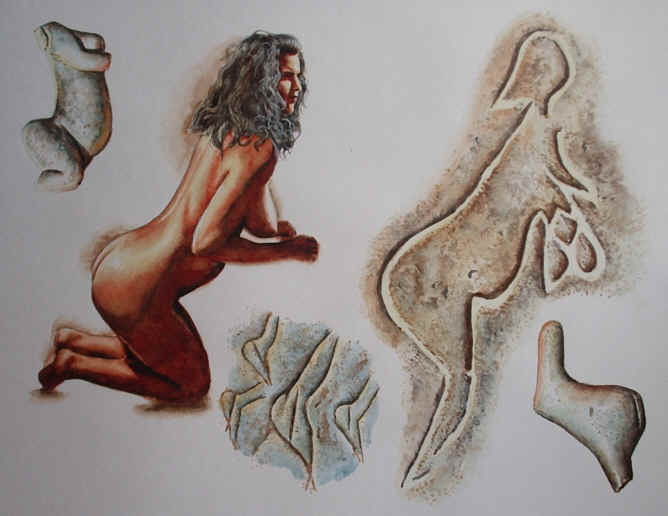 The representation of women, the unmistakable Magdalenian Venuses, was quite curious. Women’s figurines hardly bore any detail, they were often just outlined, and their bottoms were always stuck out. Some small figurines had holes for hanging. One of the few Magdalenian Venuses that provided at least some information about her hairdo.